The legal profession now has just what many people thought it did not need: another publication that attempts to give rankings to law firms. U.S. News & World Report, which for some years has irritated people with its rankings of law schools, worked with longtime evaluator The Best Lawyers in America to develop and release an inaugural attempt to rank the practice capabilities of major law firms by tiers of excellence. The American Bar Association was so concerned about this latest effort that earlier this year the House of Delegates passed a resolution asking the ABA to "examine any efforts to publish national, state, territorial, and local rankings of law firms and law schools." But that didn't stop the ranking from coming out. State bar associations, of course, have been negative toward lawyer and law firm rankings for some time. Some have been so restrictive that their efforts were invalidated in the federal courts (see the March 2010 ruling by the Second Circuit that declared most of New York's content-based attorney advertising rules unconstitutional) or state courts (as in New Jersey, which required a state supreme court ruling in 2009 to overturn a bar association ban on lawyers mentioning their ratings or inclusion in legal directories). The stated aim, as it often is with these bar organizations, is to "protect the public" from "misleading" comparisons about lawyers. That rankings might just give potential clients a better insight into which lawyer they want to hire is apparently beside the point. Ratings and rankings are nothing new. Martindale-Hubbell has long provided a two-letter code ranking of lawyers based on a peer review process, with the "AV" designation denoting a lawyer of superior skill and ethics. 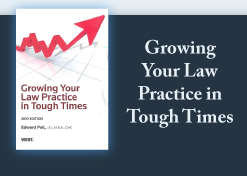 Best Lawyers in America has been publishing its book for a quarter century. Many new "authorities" have jumped into the ranking game in recent years: the Chambers directories, the ubiquitous Superlawyers publications, and many more. One of the most recent, Avvo (which is short for "avvocato," or lawyer, in Italian) uses a "proprietary mathematical model" to develop rankings of individual lawyers that has drawn fire in a number of jurisdictions. I have done podcast interviews with AVVO CEO Mark Britton and CMO Conrad Saam. Their methodology and purpose both sound convincing, and their reach is definitely growing. All of this is hardly marketing fluff. All lawyers should do an Internet search on themselves (something along the line of "my name + rating") to see what publications might be purporting to rank their ability. If you uncover a problem, the reputation you save may be your own. During my recent travels, I continue to learn from my clients and others with whom I interact. The dialogues have been exhilarating. Even as a thought leader for successful lawyers and law firms who are able and willing to invest in themselves, I continue to learn. For example, in one of my recent adventures, I had the pleasure of working with Marshall Goldsmith, "the" leading coach for most of America's Corporate 100 CEO's. He is both dynamic and perceptive. It was a pleasure to learn from him. One of the best, and most significant to me, books I've read is his MOJO. I highly recommend it to all reading me here.